When most people think of office space, pest problems are likely the furthest thing from their minds. And that is one contributing factor to why some pests are so successful in their infestation of office buildings and similar business settings. People simply don’t expect them there. But, the professionals at PEST know that pest infestations can happen anywhere, and we are prepared to do whatever it takes to see to it that those pests set up their business elsewhere. There are all sorts of cracks and gaps in your building through which rodents and insects may enter. Suppliers, vendors, and stock deliveries always coming and going is another way for them to access your workspace. These unwanted little creatures not only spread disease but can cause irreparable damage to cables, computer equipment, stock, fittings, office furniture, and more. Even if you can’t see it – the damage may already have started. It is likely that you place relatively stringent qualifications on those to whom you rent office space. The tenants that rent your space should add value to your business with their stellar reputation. The pest management company should also have a reputation that ends up looking good on you. We at PEST have a team of highly trained specialists whose primary concern is the well-being of you, your employees, your visitors, and your business. We will work tirelessly to make sure that your environment is pest free and stays that way. Why Do You Need Office & Business Pest Control? 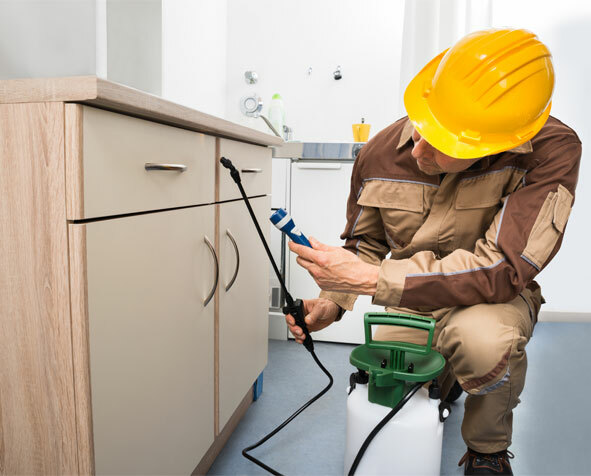 The biggest reason to hire a pest control company to rid your office of its unfortunate infestation is to protect the safety and health of your employees as well as your assets. Not only can damage caused by certain pest infestations have a severe impact on property and your building’s structural integrity, but it can also cause your employees great distress thereby lowering morale and lessening productivity. That’s a severe problem in the workplace. As an employer, it is your responsibility to create a comfortable and safe environment for your visitors and employees. You can reduce medical costs, reduce absenteeism, and eliminate any safety and health risks that may be a direct result of food contamination. Even if you don’t serve food in your building, people bring lunches, snacks, doughnuts to the meeting, birthday cake, anniversary cookies, etc. Why Choose PEST for Office & Business Pest Control Services? How quickly you react to a pest infestation in your office or place of business could have a definite impact on various aspects of your business. If you merely suspect that you may have a rodent or insect problem – or just want to make sure that you never have one – Pest Elimination Systems Technology, Inc. can help. We have the methods, tools, techniques, materials, and staff required to determine whether or not there is a pest problem, devise a plan with which to solve that problem, carry out the plan and successfully rid your office of rodents and/or insects entirely. We will follow up to make sure that your pest-free environment stays that way. Give us a call or email us today to see how PEST can assist you in making your office into a clean and healthy environment for you, your employees, and your customers.